A 60-year-old woman was born after 36 years of marriage. Mr. and Mrs. Bose Joda welcomed their bundle of joy earlier this month after waiting for over three decades. 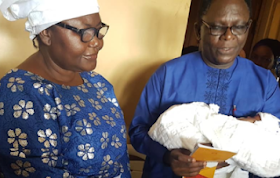 Facebook user Oluyemi Ajibola, who shared the good news, said the christening took place on Sunday, October 14, and the baby was named Ore Ofe Oluwatodimu Joda. Congratulations to you. Never too late!